This site contains an introduction to the basic concepts and mathematics, involved in Hi-Fi, tube amp building. A special emphasis is placed on the design of power supplies. The contents of the guide can be accessed via the navigation menu, and it will continue to be updated, expanded and maintained. The object of this site is to provide a solid, mathematical reference for tube amp builders. Comments, suggestions and criticisms may be sent to me in the contact form - below. Pictured above is the classic Leak 12/Plus. From the 1950s, a Basic Vacuum Tube Amplifier instructional video. For best results, watch it on youtube. Recently, the site has been updated: dead links pruned, corrections in the math chapter, CSS tweaks, etc. Over the past few days, minimal changes have been made to the website's design. This site continues to be repaired, updated and maintained - despite the utter lack of blog posts. The C3m pentode was engineered for long distance telephony - in a successful attempt to produce an ideal tube: high amplification factor, low noise, compact size, etc. It was designed with no compromises in design and construction: C3m specs. 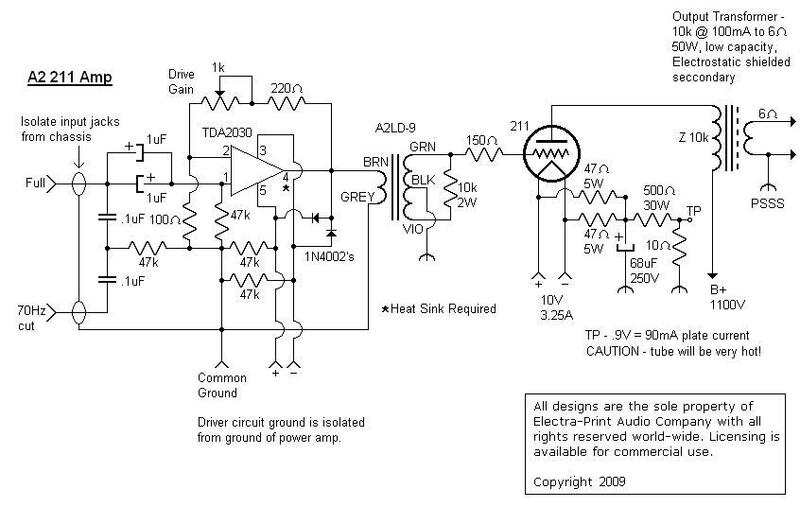 In the link below is a schematic for an SE 813 UL amp. A C3m (along with another tube) are wired-up in an SRPP configuration as a high gain/low noise driver to produce ~35W audio ouput in Class A1: diyparadiso. However, a single, C3m volt amp should be able to generate the required 80V peak to run the control grid of an 813 in SE A1 - with an acceptable level of noise. Recently, I've been experimenting with 813 rf tubes in triode mode, using "chip amps" as power-tube drivers. I figure that the audio output is ~35W in Class A2 per channel. If the interstages were not $100 a pop, a wicked amp could be produced on the (relatively) cheap. However, I suspect that the driver's power supply would produce an unacceptable level of noise without the interstages. The schematic from which the amp was derived is here. Regarding the 813 amplifier, the voltage used to energize the plates is a whopping 900Vdc. If voltages in excess of 600Vdc are attempted, extreme caution is advised.